새로 발견된 혜성, 맥홀츠-후지카와-이와모토(C/2018 V1) 혜성. 11 월 7일에 맥홀츠, 후지카와, 이와모토 씨가 발견한 이 혜성(C/2018 V1)은 11월 중에는 처녀자리 근처에서 7~8등급으로 새벽에 관측할 수 있습니다. 맥홀츠-후지카와-이와모토 혜성은 12월 3일에 태양에 가장 접근합니다. 제일 먼저 발견한 맥홀츠는 자신이 발견한 12번째 혜성으로 이 혜성을 안시 관측을 발견했습니다. 다른 2명의 공동 발견자는 사진 촬영을 통해서 발견했습니다. 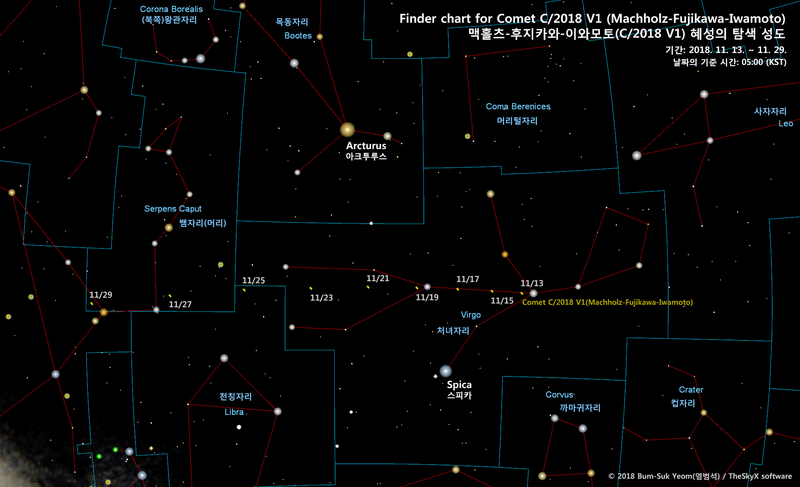 This comet was first reported by D. Machholz (Colfax, CA, U.S.A.), observing visually with his 0.47-m reflector on Nov. 7.5306 UTC, who reported a single approximate position (represented below with the geocentric observatory code) and described the tenth-magnitude object as having a 3' coma and no tail. After Machholz reported his follow-up observation on Nov 8.5326 UTC, the object was posted on the PCCP. Numerous follow-up observers then reported cometary activity. On Nov. 10.55 UTC, word finally reached the Minor Planet Center from M. Soma and I. Endoh at the National Astronomical Observatory of Japan (who were unaware that comet reports must now be reported to the MPC) of two independent discoveries of this object from Japan: S. Fujikawa on Nov. 7.82 UTC, from Kan'onji, Kagawa; and M. Iwamoto on Nov. 7.84 UTC, from Awa, Tokushima. Fujikawa used a 35mm f/3.5 lens, while Iwamoto used a 0.1-m f/4.0 telephoto lens. 2018. 11. 13. ~ 11. 29.